April 11th was National Pet Day and it was #ToungueOutTuesday. So many of our Facebook followers shared photos of their pets! 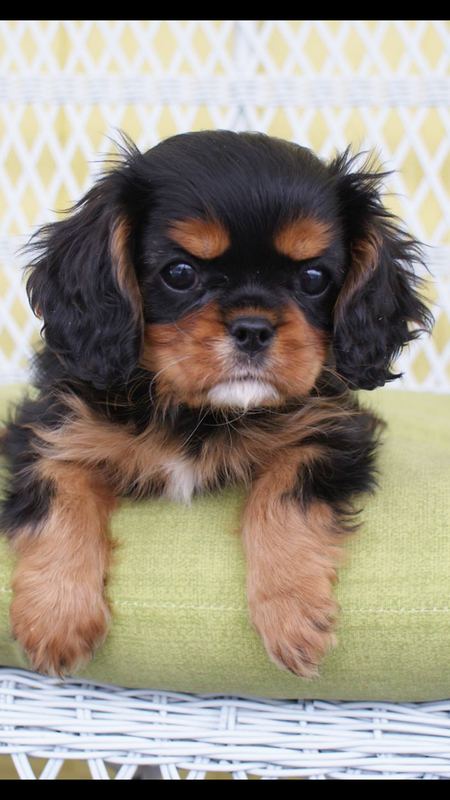 To see all the beautiful photos, visit us on Facebook at: https://www.facebook.com/CavalierAlliance?ref=bookmarks and click Like to follow all the happenings there! Compelled to respond. . . Lately, we have noticed several untruthful remarks posted to our Facebook page and other places on the internet. We are compelled to respond to these remarks, both because we are committed to provide the best care for the cavaliers in our program, as we have always been, and because we must protect our reputation. Otherwise, some people might take our silence for acceptance. It is not. A breeder called and asked that we take title (transfer) of her litter of Cavalier King Charles Spaniel puppies. 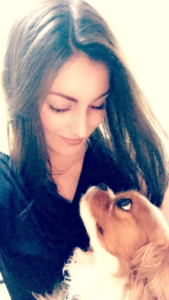 She described symptoms that were consistent with Syringomyelia (“SM”), which is an extremely serious condition in which fluid-filled cavities develop within the spinal cord near the brain. SM is also known as "neck scratcher's disease,” because one of its common signs is scratching in the air near the neck. She sent us video to document her belief that some or all of the puppies from this litter exhibited this symptom. When we picked up the puppies, the breeder transferred title (i.e signed an owner release) to us as is common, for four puppies. We must have title to the puppies to make sure we have the ability to get them the best possible care. We immediately vetted all of the puppies, at our expense, including having them examined, diagnosed and treated by some of the best veterinarians in the country. The veterinarians did not believe that the scratching was due to a vaccine reaction. We also found appropriate, loving foster families for these puppies, which is what Cavalier Alliance does. Contrary to what has been asserted, we do not, and did not, sell these puppies. Any assertion to the contrary is false. Shortly after we began working with these sick puppies, we were contacted by the breeder who wanted the puppies back. At first, she offered to buy them, and for a substantial amount of money. When we refused, she hired a lawyer, which is her right, and brought a lawsuit to try to compel us to get them back. - First, we were very concerned about the health of these puppies when they came to us. They obviously had not been properly vetted, if they had been vetted at all. It was also evident that they were suffering from symptoms that were indicative of dermatologic and neurologic issues (consistent with SM). Their condition had to be properly diagnosed and treated by a veterinarians and specialists- once again this had not been done before we received them. 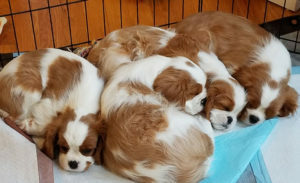 - Second, one these puppies had actually been sold by the breeder to an unsuspecting person who soon recognized that the puppy was ill. That person should have been told of the symptoms in advance of the sale. The buyer returned the sick puppy to the breeder and this was one of the four puppies that were transferred to us. - Finally, we do not sell puppies and we were not about to start. We were getting increasingly concerned that there was an effort to hide the condition of these puppies, which is not right, in our view. We were committed to getting these puppies the best veterinary care we could and providing them with loving families if we could, and were not willing to sacrifice these principles for money or to advance ulterior motives of others. That unfortunately necessitated us hiring our own lawyer to defend the lawsuit brought by the breeder. 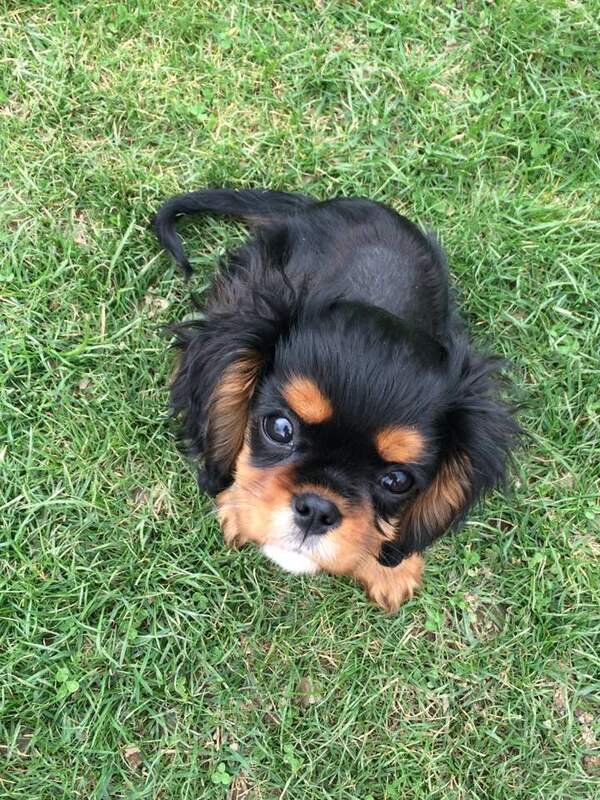 After all, just as the breeder was entitled to counsel, Cavalier Alliance was, as well. We decided to pay for legal counsel rather than accept a substantial offer from the breeder to take these puppies back, because we had no confidence that the puppies would be treated properly or that the breeder or others might not attempt to profit unfairly from the situation. 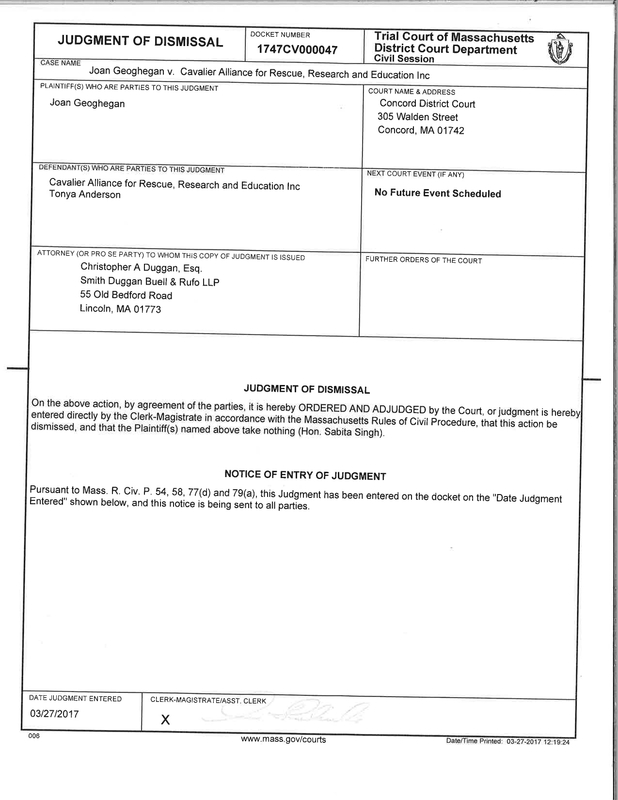 We are happy to report that the lawsuit ended quickly with a judgment in our favor. 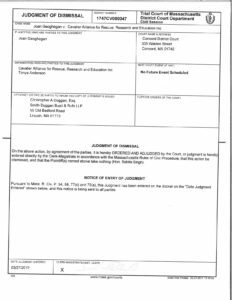 This was not a settlement – the breeder’s lawsuit was dismissed and a judgment entered against her. We are happy to supply anyone who wishes with a copy of the judgment. We are distressed that we had to spend so much time on this, and that we were compelled to write this lengthy description of events. But these are the facts, the truth, and we could not remain silent while others were saying untrue things about us. We hope that this is the end of this and that we can all get back to spending our time on caring for these beautiful cavaliers, who need and deserve our love and attention. Poppy is a darling, 8 week old, under 3 lb, puppy with a heart defect known as PDA, that can be fixed with surgery. 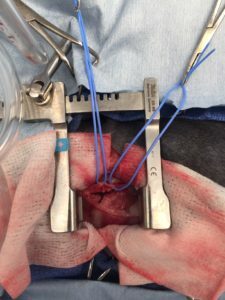 Without surgery, her life expectancy will be very short, but assuming she makes it through surgery, she has an excellent prognosis for a normal life. She is scheduled for surgery at Cornell University in the coming weeks and we are asking for your help so that we can fund this life-saving surgery for her! No gift is too small and we will all be appreciative for whatever assistance you can provide. Poppy was born with a patent ductus arteriosus (PDA). 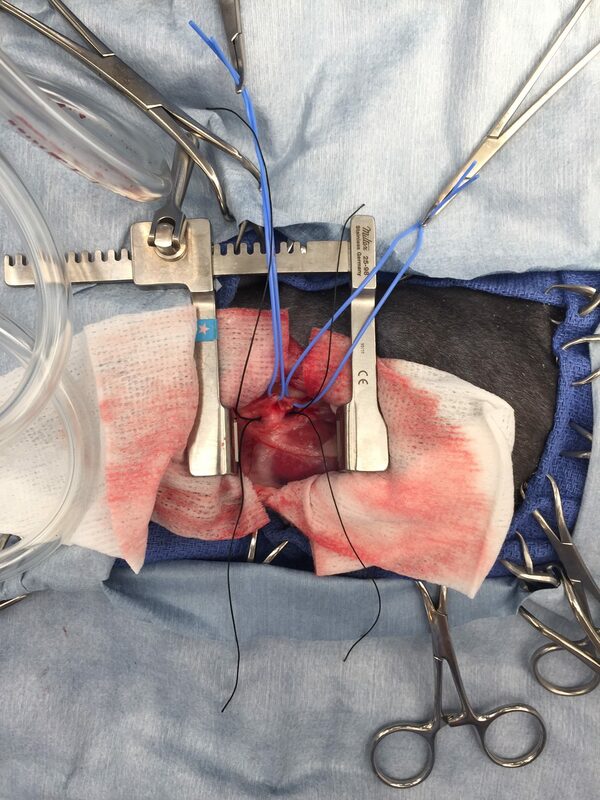 Normally the ductus arteriosus, an important blood vessel, shunts blood from the heart and bypasses the lungs when puppies are in the uterus before birth - they don’t need to breath, so there’s no need for blood to go to the lungs. At birth, this blood vessel normally closes, so that oxygenated blood reaches the lungs and then is circulated to the rest of the body, providing oxygen rich blood to important tissues. If the ductus doesn’t close properly, the heart has to work extra hard to pump oxygenated blood to these important tissues. Eventually, the heart muscle becomes thickened from working so hard and, in time, the heart muscle weakens and heart failure and death results. 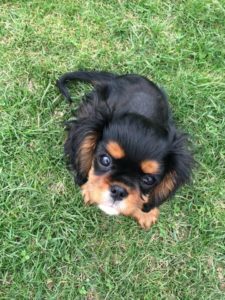 Poppy already, at only 8 weeks of age, has evidence that her heart muscle is thickened. With prompt surgery, her heart can repair itself before the damage is permanent, but there isn’t much time. 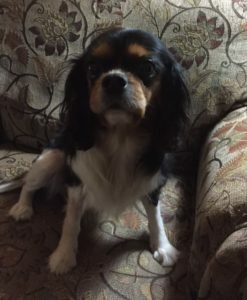 If you would like to donate to Poppy's surgery and care, please visit our donate page http://www.cavalieralliance.org/donate/ or send via PayPal (friends and family option) to CavalierHelp@CavalierAlliance.org . . . Thank you to the NY / NJ Cavalier Meetup Group! 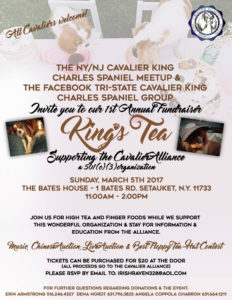 Huge shout out of thanks to all the amazing folks and cavaliers who came out for the March 5th King's Tea. So much fun was had by all and they raised over $6000 for the pups in our program. 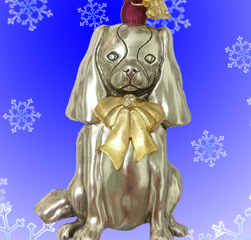 The 2016 Cavalier Alliance ornament is now available for pre-order! This year our ornament was again designed by the talented Lauren Hamelin, and each one will be custom made for us. 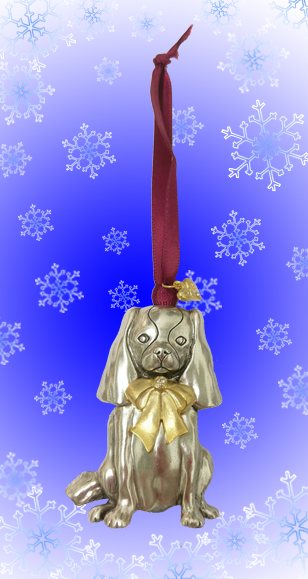 This year's ornament features a sweet cavalier with a matte gold bow, dark red ribbon and a small gold heart charm. Each ornament is approximately 3" high and almost 2" wide. The ordering period will close soon to allow for plenty of time in manufacturing and shipping. Order at: Cavalier Ornament 2016 and check out with your Paypal account or via credit card. If you’d like to order via check, simply send the check with your name, shipping address and details on your order to us at: 64 Cedarwood Road, Boxborough, MA 01719. 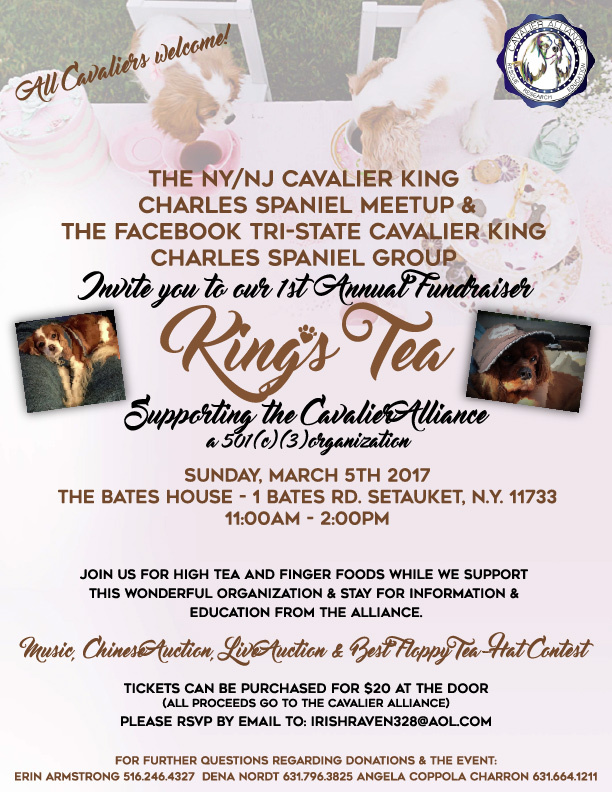 Thank you so much for supporting the Cavalier Alliance!